Strangelove is an old favorite of mine, cool to know that your dad was part of it. It's a pretty edgy movie for 63', the first time I saw it in the mid 70's it was hard to know if I was supposed to laugh or not as they play it straight but it's so absurd. Remember the cheesy 1970s thriller "Burnt Offerings?" Sure ya do. But do you remember the godawful phone? It looks as though it should be a 202. The E-type handset has been worked over by the property department, though, and the base looks to me to be one of the Korean repro bases (did they also repro the handsets?). The dial seems to be standard Bell issue, or at least the fingerstop is the in proper WE/NE position. 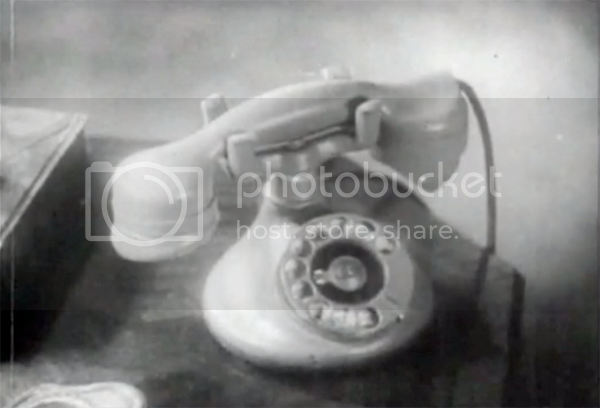 Later in the film, the phone is dialed, and you can hear the unmistakable clicking of a #4. Whether that's a sound effect added later or is the actual dial on this phone is hard to tell. Like most movie phones of the last half of twentieth century, it rings like a 500 (sound effect). Never saw that movie but that phone looks like a classic Hollywood work over job. And it's funny how every phone that rings in a movie or TV show from about 1960 to 2000 sounds like a 500. Must be that they did not want to confuse the audience with other sounds since we all were programmed to recognize that sound as a ringing phone. Sort of like all the doorbells in shows of that time sounded pretty much the same as well, that classic "ding-dong". I watched Philo Vance and the Kennel Murder Case today, and there was a smorgasbord of phones in use throughout the film. In honor of our current auction contest, here's a WE 102 in a metallic finish. My guess is that it's Old Brass. It's too dark for Oxidized Silver, and with the light body color and dark highlights, it's probably not Statuary Bronze, which is dark with light highlights. You can see that the transmitter cap has been replaced with a standard black one. 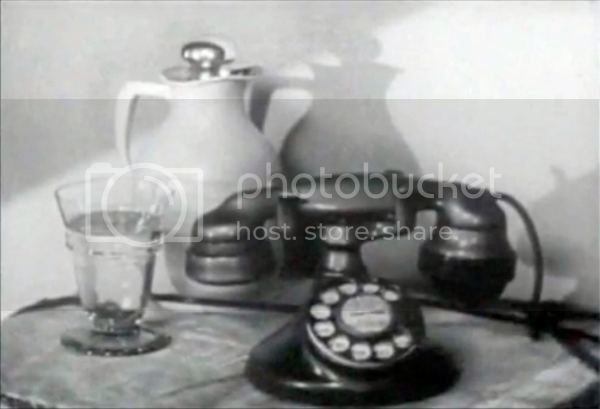 This phone makes an appearance in two different places in the film: Once in a swanky house (above), and again at the purser's desk on a ship (below, right). At least it's not a lamp! A nice clean 10 button with no yellowing or fading, that would be great. I'll have to watch some old Mission Impossibles. I must have been on a Doris Day kick when I added a few movies to my Netflix que. When I add movies, I don't usually put them to the top, I just wait for them to cycle up. "Pillow Talk", "Glass Bottom Boat" and "Pajama Game" just came in the mail. Anyway, just watched "Pillow Talk". The title is off, IMO, should have been called "Party Line", but that's for another discussion. I don't care what some people think, I like the young Doris Day. Gorgeous, charming, vitalic. Enough of that. The phones. The two phones used by the leads, DD and Rock Hudson, were white 500s. I gave me a new perspective on my so far only white 500 from the 60s. (It's in a thread here somewhere). It will be getting more attention in the near future. Although it cleaned up very well using just Oxiclean and a Novus rub, it could still use a little more whitening, particularly the handset caps. I'm at the point now where I'm more willing to try the Retrobrite process. How about the SOUND of old phones? I'm thinking of a couple of recordings from the radio series Suspense!. Sorry Wrong Number and The Hitchhiker. 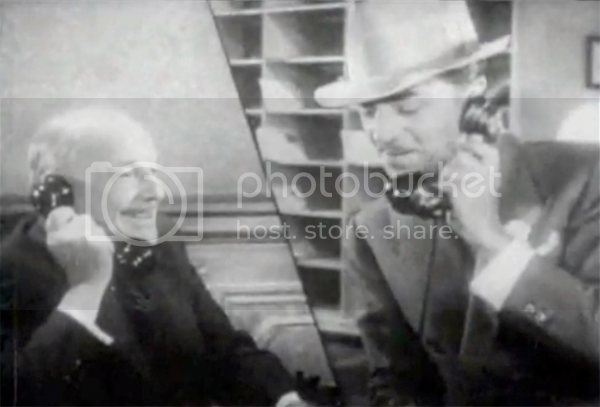 Both have plot lines centered around making a phone call, and like the old radio shows themselves, the listener can only "see" the action in his/her mind. I'm sure the experts here could tell the make and model of the phones just by sound :)Funny how so much effort was involved in making and receiving a call, especially long distance, from the operator connections across the country and waiting for the coins to drop into the payphone. Never saw that movie but that phone looks like a classic Hollywood work over job. And it's funny how every phone that rings in a movie or TV show from about 1960 to 2000 sounds like a 500. Sort of like all the doorbells in shows of that time sounded pretty much the same as well, that classic "ding-dong". And speaking of "Ding Dongs", how about the single slot payphones in movies that still ding and dong when a coin is put into them! There's a fascinating clip from Dragnet (the radio version), in which Joe Friday places a long distance call, and we get to hear the entire process with the operators and real sounds. I wish I could remember the episode it came from, because it's a real glimpse into the past that most people have forgotten. The clip may have been shared here, but I just can't remember. Russ Price has made this clip available via C*NET. The number to listen to the clip is 1-442-3724. I love both of those Suspense! episodes. You can often find them on CD at the Cracker Barrel restraunts for sale. 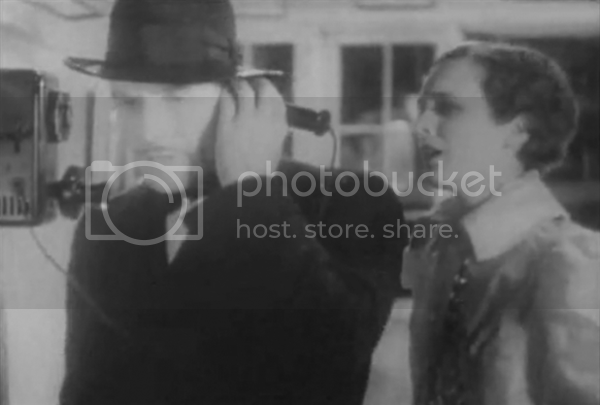 I believe "10 cents a dance" with Lucille Ball also has some telephone sound effects, but I could be wrong. "The Hitchhiker" has been a favorite story of mine for many years.